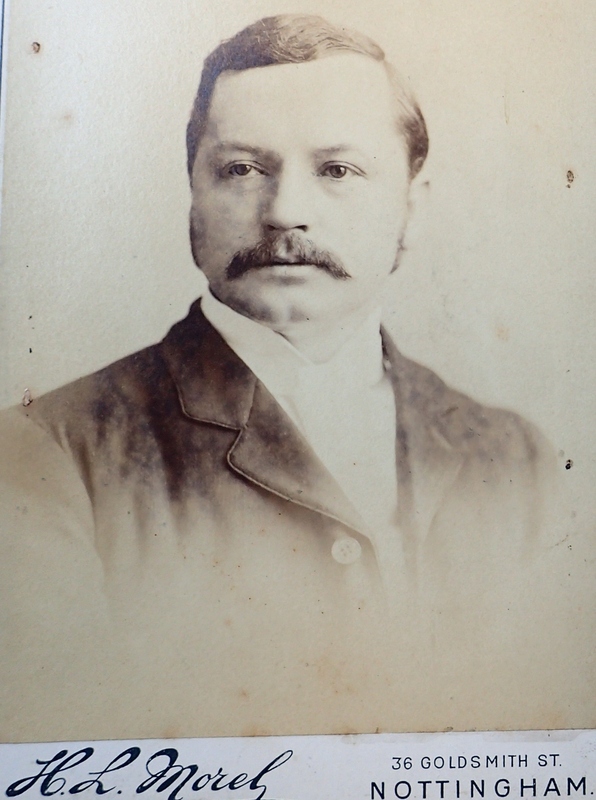 Born in 1855 Allen Tatham was the youngest son of needlemaker Edmund and his first wife Elizabeth (nee Burgin-Richardson). Residing at Hillside House, Nottingham Road, Ilkeston in August 1894, he appeared at Nottingham Bankruptcy Court. Alongside him was his partner Joseph Newsome Milne of Watcombe Circus, Nottingham and together they had traded as Tatham & Co of 14 High Pavement, Nottingham and of the Kensington Works in Ilkeston. They now appeared together to apply for their discharge from bankruptcy. The following details came out at the hearing. About 1878 the two had begun business as lace manufacturers in Nottingham with Allen’s elder brother Edmund junior, trading as ‘Tatham Bros’. At the same time Edmund Tatham senior was in business as a lace manufacturer at Ilkeston and Nottingham. He died on March 4th 1887 and in his will appointed Edmund junior, Allen and Walter as executors and trustees. After the payment of some annuities and legacies these three sons received the remainder of the estate in equal part. This included a freehold warehouse in High Pavement valued in 1885 at nearly £9000, and a freehold factory and premises at Ilkeston valued at over £12000. All freeholds were subject to mortgages. Shortly after the death of Edmund senior the firm of Tatham Bros amalgamated with the father’s business and became ‘Tatham & Co’. The partnership dated from December 31st 1887. In May 1889 Edmund junior retired from the firm, signing over his interest in the firm to the two remaining partners who continued to trade as ‘Tatham & Co’. Like his father, Allen would borrow money at 5% or 6% from ‘Money Clubs’ to use in the business, loans which were sometimes reduced, sometimes renewed and increased. Sometimes more loans were taken out to pay back existing ones. This was all set out in a well-kept set of accounts and the last balance sheet of the firm, dated September 17th 1892, showed a credit of over £1600. Unfortunately the firm was using the 1885 valuation of its premises which by 1892 had lost several thousand pounds in value. It was argued that the partners should have known this and thus should have known that they were insolvent at that time. However the firm continued trading into 1893, a time of depression for the lace trade, thus incurring more debts. However Allen had traded in good faith, had used much of his savings to invest in the business and had very frugal habits. He was also the mainstay of his widowed (step-) mother ( Mary nee Green the second wife of Edmund senior since 1878), his sister (Elizabeth Jane?) and his brother (?) The inaccurate valuation of the firm’s premises had led him to believe that the firm was solvent while there was enough income from the premises to pay the interest on two of the mortgages. The judge in charge of the hearing concluded that Allen had struggled on too long, hoping for an upturn in trade which did not materialise and had thus worsened the firm’s position. Now his assets realised less than 10s in the £ on the amount of his unsecured assets and under the terms of the 1890 Bankruptcy Act (Sub-section 3 of Section 8) he would have to suspend Allen’s discharge from bankruptcy for at least two years. In fact because the firm had continued trading the judge added an extra year to the minimum. from the Nottingham Evening Post, Friday August 5th 1932. 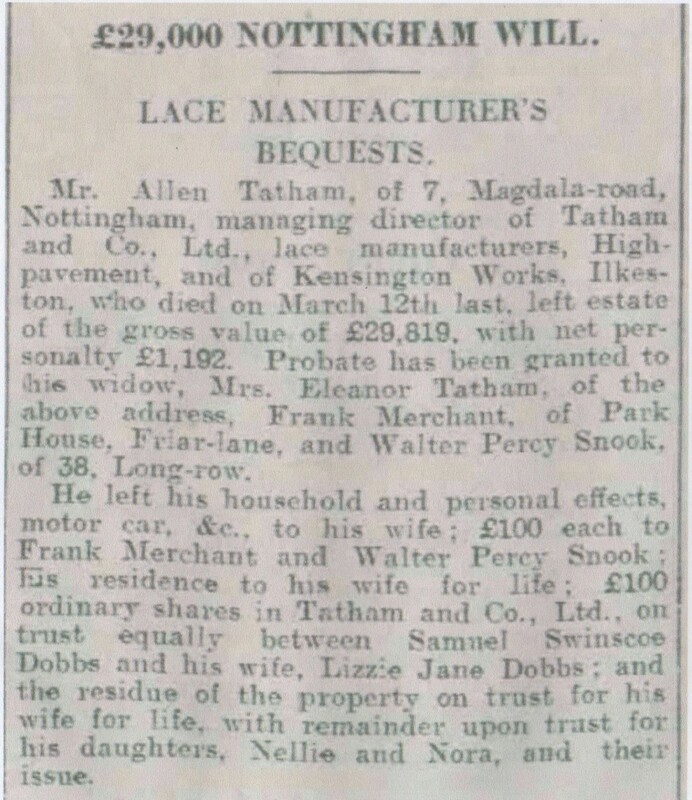 Allen died on March 12th 1932 at 7 Magdala Road, Nottingham, aged 76, then styled by the Derby Daily Telegraph as the Managing Director of Tatham & Co. Ltd., lace manufacturers of High Pavement, Nottingham, and Kensington Works, Illkeston. As the newspaper article above shows, in his will Allen left his home, his household and personal effects, his motor car and the majority of his other property to his wife Eleanor, whilst leaving shares in the company to his only surviving sibling, Lizzie Jane, and her husband Samuel Swinscowe Dobbs. His daughters Nellie and Nora also received bequests on trust. My thanks to John J Stokes for contacting me about his links to the Tatham family. My family history interest in the Tathams is linked to the marriage of Eleanor Redhead, daughter of William & Ann (Stokes) on 17 June 1891 to Allen Tatham (at the Parish Church of St. John the Evangelist, Spitalgate, Grantham). They had two daughters Nellie (spinster) and Nora who married Albert Leslie Jones, (and) with their daughter Jennifer Noreen Jones, all of ladies appear to have run the firm Tatham & Co Ltd after Allen’s death in 1932. The article in Part 1 ‘Father Benjamin’ (on the previous web page), implies (incorrectly?) that (the firm) was run by the ‘Marriott family’ …. possibly a different business?. John has recently (March 2016) visited the Manuscripts and Special Collections Department of Nottingham University and has kindly shared his notes made there …. The Tatham family were connected with needle and lace manufacturing in Ilkeston, Derbyshire, from at least 1835. Benjamin, Edmund and Amos Tatham bought Kensington House in Ilkeston in 1859 and turned it into a lace making factory. 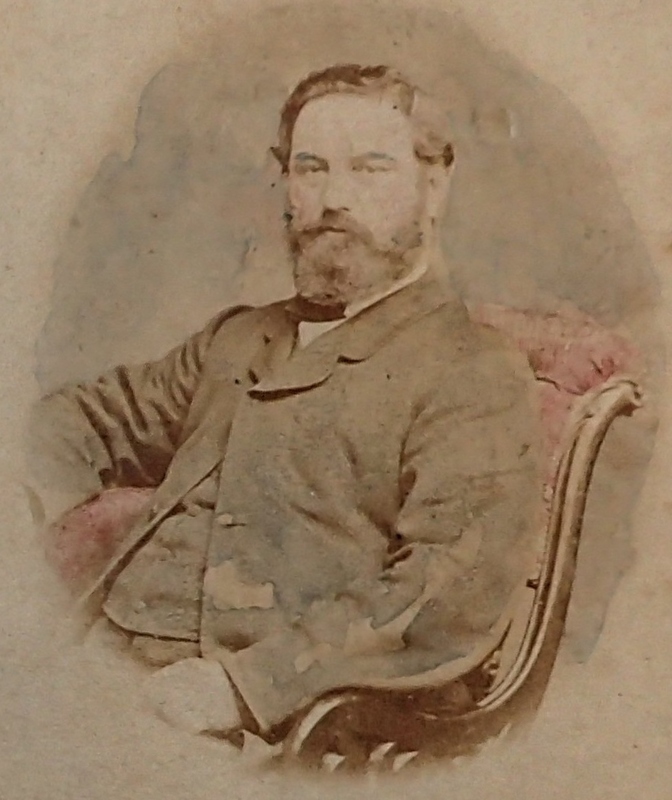 Edmund Tatham extended the company’s premises with further purchases of nearby land over the next fifteen years. The Kensington Works on Nottingham Road were built in 1887. The Tatham family also owned a house and outbuildings at 14 High Pavement in Nottingham, which was used as a lace warehouse. Tatham and Co. went bankrupt in 1893, but a new company, Tatham and Co. Ltd, was incorporated in 1894 with Allen Tatham as Chairman. Allen Tatham died in 1932 but the company remained family-owned throughout its history. Successive Chairmen of the company were …. …. Allen’s widow Eleanor Tatham (1932-1950), ….. died on October 22nd 1950. 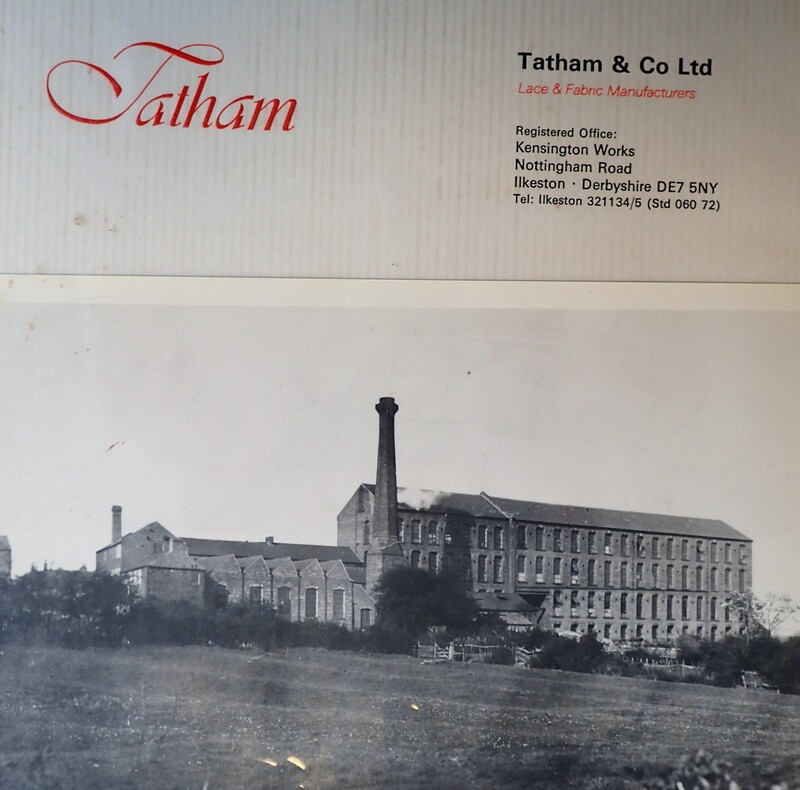 The original Tatham and Co. Works continued to be used for lace and textile manufacturing, despite being damaged by another fire on 25 February 1980. Several antique lace machines, which would have been donated to local museums, were destroyed in this blaze. The company remained in business until the early 1990s. Perhaps someone can identity one or both ? ?